Get to know one of Taipei’s most vibrant neighborhoods on this private walking tour of Ximending. Meet your guide at the Ximen MRT Station in the afternoon, and get ready to explore. You’ll visit one of Taipei’s oldest temples (the Tianhou Temple), will walk along the area’s bustling shopping streets, and will learn more about Ximending’s history from your guide. 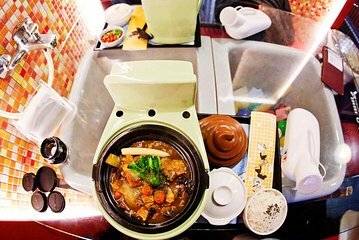 Then, finish the evening with an irreverent, one-of-a-kind dinner at the ever-popular Modern Toilet Restaurant. My tour guide was awesome!! she showed me all the amazing locations and we ended up having a fun dinner together.